In rural areas of Latin America provision of public health services is often a major challenge. Access to adequate healthcare remains an elusive prospect for many people around the world, and Latin America is no exception. After extensive privatisations in the late 20th Century, a two-tier system has emerged in which those who need help the most often find themselves unable to afford vital treatment. Throughout the region, health services favour wealthier and urban areas, while provision in poor, rural, and indigenous communities remains negligible. Further complicating these problems are serious public health issues, including epidemics of communicable diseases, natural disasters, pollution, and systemic violence. The health of all Latin Americans has formed a huge part of our work, from our opposition to mining and the banana trade, to our support for food sovereignty and women’s rights. Nevertheless, the current state of health and healthcare remains a pressing concern for LASC, and an area of continuing campaigning. From as early as 2004, health has been a major focus of our solidarity work. In that year, Latin America Week was used as a means to bring these issues to the fore, launch our education campaigns, and give a platform for important debates and speakers. 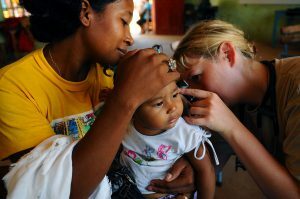 Exploring these issues of health has allowed us to expand our understanding of many other issues throughout Latin America, and it is a perspective that we continue to carry in our work.